Drop in on a casual basis or come regularly. 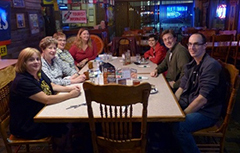 Theology on Tap is a group who explores faith through conversation. What is our relationship with the sacred? who are we? Where do we fit? A bite to eat, a beverage or coffee make for an enjoyable time. Join us on the first Thursday of the month at 7 pm at Big Guy’s on the corner of Meadowood and Dakota for drinks and conversation. All are welcome.